August 25th, 2016 (4:54 PM). Oml thanks for the replies xDI had to take a break to get back to my writing, but now I am ready to play more! The squatch was level 40 when my team was barely 20, hence why I was scared XD I can't wait to finish this and will probably be up all night doing that! Don't worry, it would just run away from you. It's actually possible that could be your very first encounter ever. August 25th, 2016 (5:54 PM). August 25th, 2016 (6:03 PM). Sometimes sprites will do that if their movement isn't set to "no movement", it seems to happen randomly. I'll set him to "no movement" for my next patch though. August 25th, 2016 (6:58 PM). Where the heck is waterfall? I beat the water gym and checked all the dive spots and I can't find it anywhere. August 25th, 2016 (7:55 PM). Great game, love seeing completed hacks and I also loved Fuligin, so it works out. But I have absolutely no idea where I'm going in this game. Maybe it's just the fact that it's a new region and everything, but I'm confused. So far I've got 5 badges, I'm at the Muerton City gym, and I -think- I've got a decent grasp of the story. Will there be a walkthrough of some kind, or can someone possibly make one? August 25th, 2016 (8:16 PM). Good thing I'm here! No? Anyone? There's one in Northsky Cave, and one in Hardai Pyramid. August 25th, 2016 (8:29 PM). Edited August 25th, 2016 by Theycallmejesus. August 25th, 2016 (8:38 PM). Edited August 25th, 2016 by TheSilverone. August 25th, 2016 (10:55 PM). August 26th, 2016 (2:30 AM). August 26th, 2016 (2:59 AM). This game has a interesting storyline but the only problem is travelling and confusing storyline like where do you go after knowing that your dad is evil? August 26th, 2016 (3:53 AM). August 26th, 2016 (3:55 AM). August 26th, 2016 (3:56 AM). August 26th, 2016 (4:32 AM). Yes, I noticed that, but the guy that blocks it is not moving! August 26th, 2016 (7:00 AM). So I'm watching someone else playing this and have noticed something odd. After a Gym battle at Lv.8, you introduce a rival whose highest Pokémon is...Lv.4. Why not bump him up to Lv.9 or such, or is there a story to why he's weaker? Also, the line about pants being itchy and uncomfortable - I laughed, best line so far. I also think I'll play this and try piecing the maps together. I have a feeling that the Routes 1-4 circle is not going to be connected correctly. The most important thing, IMO, when creating a world is to make sure everything connects so that people can post region maps if they want to, and when I played Light Platinum, that was the biggest flaw as I had a huge unconnected segment where they should have connected. So I'm curious about this one as the game initially looks good. "Y'know...my Emolga really wants to shock your Dedenne." Cyclone. FC: 2079-8536-2160. Safari on X (5327-1949-9511): Lampent, Pumpkaboo, and Golurk (Ghost). Champion of the GC11 Pokémon Challenge! Building an event collection. If you want to help my sickness, ask what I have to trade! August 26th, 2016 (8:22 AM). Anyone know where I go after beating the gym in Whiterock Town? August 26th, 2016 (10:46 AM). What do I do after beating the gym in Muerton city? I can't surf from route 28 to cedaport and I traveled the whole region and lost a lot of money to repels just trying to find a way to get there! August 26th, 2016 (10:53 AM). August 26th, 2016 (11:09 AM). August 26th, 2016 (11:17 AM). You have to make your way through the rooms upstairs and then once you find the basement key you go through the doors in the lower level. One of them leads to another room the has fly and the gate key. August 26th, 2016 (12:47 PM). August 26th, 2016 (12:53 PM). August 26th, 2016 (1:12 PM). Edited August 26th, 2016 by Cyclone. OK, looking at the game so far around the first "circle", it looks nicely designed and looks like it will be fun to play. However, I'm a critical appraiser type, and I have noticed a few things. I'll cover bugs one at a time. Second might be able to not be considered a bug, but I thought I'd point it out. It's another reference to Hoenn. Maybe your Mom is watching a show being broadcast from Hoenn, I dunno. Next is something your bugtesters should have picked up. You better check all of your signs in the game. I found this going straight south of Easton Town onto Route 104 with no Pokémon. 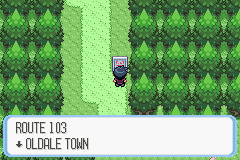 It's clear that you used the Route 103 map to create Route 4 in your hack. Now, since I was mapmaking and at this point went into map mode, I didn't check anything else in detail yet. However, there are two massive map bugs. Both are easy to fix, I will offer solutions. That water cutoff is pretty noticeable. So here's what I propose for a solution: actually extend the water out of Seashire City to meet with Route 4's liquid and make it so that players cannot traverse to the ocean beyond at all. There would be a connection to the ocean and you would need to extend the map by about 6 columns so that players do not see the tree border that is normally in the area you would now be able to see by surfing. This fits perfectly with the right border of Seashire City; if you need to extend by two more eventually, also extend Seashire by two tiles and fill it with water. Rocks can be added on Route 104 to divert players returning here to the south into the normally unreachable part of the city. Stick an item up there on a new patch of shore to reward someone for going there. Problem solved. Next map problem: I made a circle of the entire opening area wrapping back around to Easton City, and found that the maps do not properly fit. I left off without adding Route 4, which doesn't fit for two reasons. I'll explain below the spoiler, which is used due to image height. First, the space between the Easton southern exit and the Seashire northern exit, vertically, is about six trees; on Route 4, you only wind up three trees over. Again, this can be fixed by extending the map to the left; there is eight trees of unfilled space on the full map. Something of note here is that the Route 104 west side MUST match perfectly the Easton southern exit, so you will be forced to significantly extend Route 104 to the east to also fix this western problem, thereby expanding Seashire City as noted above to match the eventual width of the Route (this is optional, but looks nicer and means less filling in later). Second reason is the amount of horizontal space that needs to be added; the length of the route is about 39 trees from south to north, and you only have room on the map I'm showing for 12 trees horizontally. As a possible solution, you can use the early cave - perhaps making it longer or moving the eventual indoor exit further to the south - to gain some space back, and thereby extend Route 2 by a significant portion; you could easily move the Route another ten or fifteen trees south, giving you a possible 27 trees to work with. Besides, this cave SHOULD be bigger; after all, it's your first chance to get the 'Mons inside! 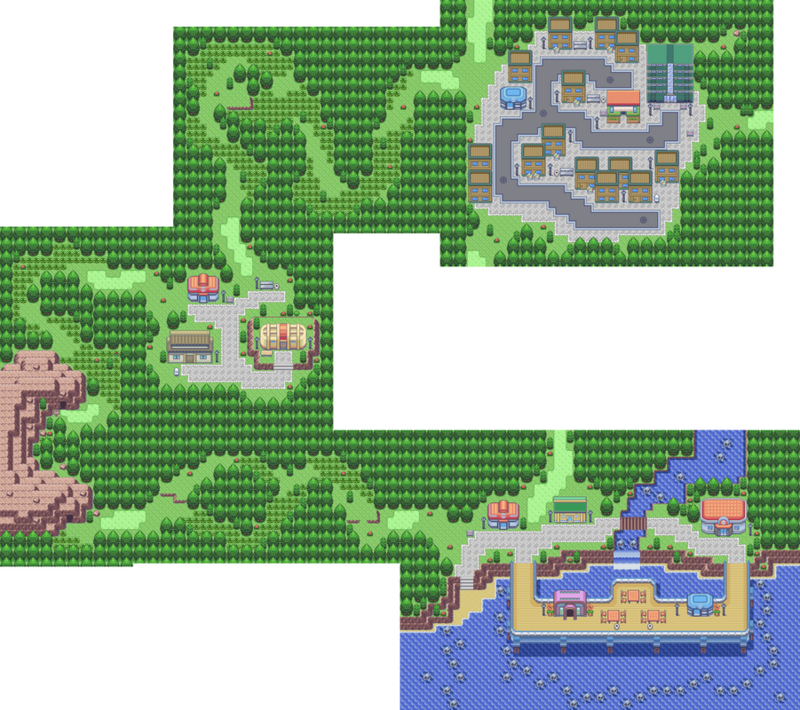 At this point, after expanding Route 2, you just have to trim 12 rows off of Route 4 while making the other suggested improvements to it, possibly sticking the fisherman further south of his current location on a dock connected to the other horizontal bridge and removing that section entirely, for starters. 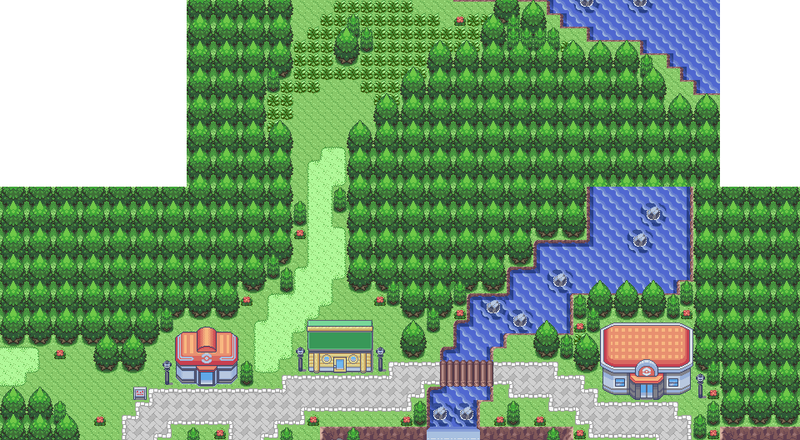 Back to Route 2, you can keep the initial exit and have it go to the newly created Route 2 area, sticking perhaps another Trainer and an item in the area. Other than that, thee game looks like a very well-designed game, but I am sure there are other map inconsistencies and bugs that need to be squished, so I will keep hunting. I'm hoping you're willing to make the improvements necessary to finalize a seamless map to go with what looks like a very good hack to play! :D I'll check the circle with Routes 5-8 next after I play through this area. August 26th, 2016 (2:20 PM). I've a problem, though. I just beat the 11th gym and when I went to route 36 I got a text box on events that didn't happen for me yet. This occured a second time when I made it through Victory road. I am now in SilverStar City, so it sounds like I really missed something.